We are down to the final three suggestions for the title to the above horse drawing. You can read the previous post explaining the contest and rules here. It was hard to narrow it down to three but the judges have each picked their favorite and in no particular order they are listed below. 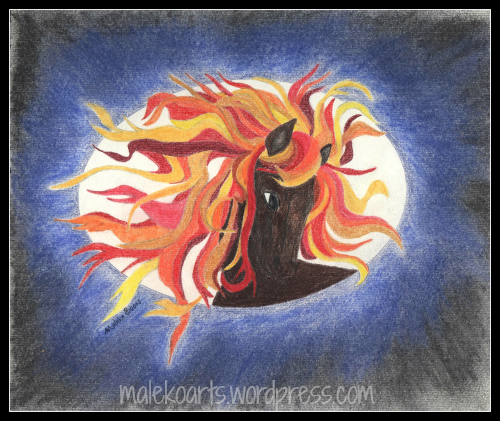 Please cast a vote for your favorite by visiting the either leaving a comment below, tweeting your favorite to @malekoarts on Twitter or visit & comment on the MalekoArts Facebook page. The voting will go through Wednesday, March 13th and the winner of the $10 Amazon gift card will be announced shortly after that. This entry was posted in Adventure, Animals, Art and tagged 2013, Amazon, Animals, Art and Life, Contest, equine, friends, Fun, Gift Card, horse, stallion. Bookmark the permalink. Due to illness, I did not participate, and this is my first time seeing your painting. Although I didn’t participate, I have to comment on the absolute beauty of this painting. It is stunning, and the blazing mane makes me think of what the horse Jesus will return on a white horse. Brother, I don’t know if you’ve ever thought of painting that horse, but may I suggest that you prayerfully consider doing so? My friend, when I read this passage of scripture, I get so excited at the visions that come to mind, not to mention the hope of one day seeing Jesus’ glorious and terrible triumphal return. And when I see your artwork, and as I looked at this glorious steed that you painted, I wondered if you would prayerfully consider putting the scripture above on canvas and online for us to be blessed by and enjoy. Much love to you my brother, and I pray the Lord continues to bless you as you share your many gifts with us. Thank you for your kind words, I am honored by your request and will see what I might be able to do with the Lord’s help! If the shoe fits? Name it!!! Blazin’ Mane — ha ha…I’m biased!